Another cryptic tweet by Matt Drudge has people chattering across the Internet. Issued on June 10, 2015, (screen shot shown below) Drudge writes "Next 18 months going to be EVERYTHING. Bigger than campaign news: Obama's scorched Earth exit. You've been warned... "
The comments in response to this warning from Drudge show people are wondering what could be worse than what we are already seeing happen across the nation today, as one person tweets "@DRUDGE what does this mean ? Things are horrifying enough now!" For a political personality there isn't much that is considered "bigger than campaign news," leading us to wonder if this is about talk of total economic collapse, or the out-there chatter about an asteroid hitting earth, which became so prevelant that NASA actually felt the need to respond by saying "'The probability of a major collision is quite small." Then we have the military drills and exercises, taking place and those scheduled to take place such as Raider Focus and Jade Helm 15, where military equipment is being positioned around America, making it look like the country is preparing for a major war on U.S. soil or even more ominously, like the U.S. government is preparing to go to war with its own citizens, and considering the latest attacks on the First and Second Amendments, as explained by the Allen West website, the latter possibility seems much more likely than the former. We’re entering that dangerous area of critical mass where America has an executive branch and a president who in their final eighteen months together will complete their fundamental transformation — by any means necessary. The Obama administration and the progressive socialist left have effectively become “da man.” And because they’ve gone down that path, we may be entering a time of warranted civil disobedience. To think, that if I, Allen West, a law-abiding American citizen, were to write technical details or make a video about my Bushmaster AR-15 on this website without prior approval of the State Department, I could face a $1 million fine or 20 years in jail is simply beyond belief and comprehension. Welcome to the new America, courtesy of your friendly neighborhood liberal progressives. The examples of what Drudge could be referring to go on and on and on, but one comment to Drudge's latest warning encapsulates what Independent Journalists have been saying for years, saying "Obama's scorched Earth exit? You offered excellent advice @DRUDGE when you recommend everyone have an exit plan." 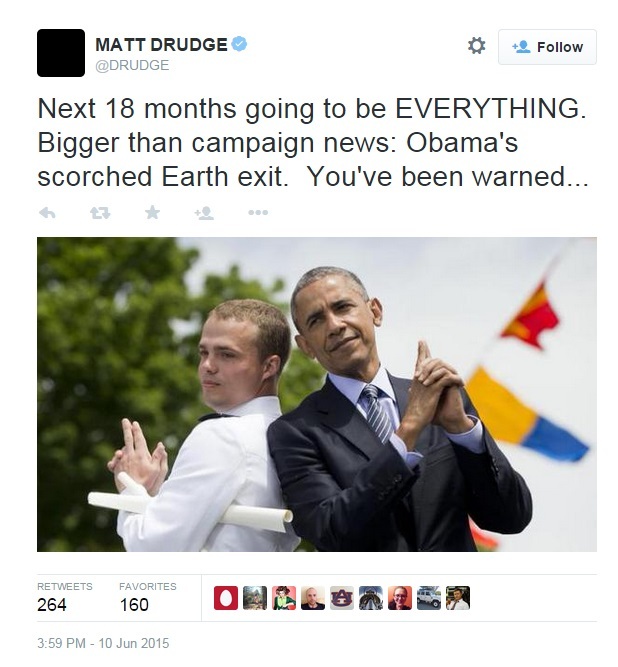 That response refers to a prior Drudge warning from January 2014. Whatever Drudge is referring to, having an exit plan and being prepared... is excellent advice.